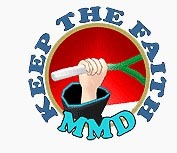 MMD Theme Video “Let’s Dance NOW!” says it ALL! I realize that my long description, above, only scratches the surface of what MMD 7.39 is all about. As a child … the child within me … I can’t describe how happy my heart was when I found this beautiful art form. The cute characters, the total freedom, the color, the music, the artificial reality … There are so many videos I’d love to share with you on these pages … but … That’s YouTube’s job “:o). This was shown as an opening movie in MMD Workshop of Anime Expo 2011. “Let’s Dance NOW!” … like so many MMD videos …gives me a wide smile when I watch it … and the joy lingers on! Here’s another of my new favorites. This one by AOKI2720. Just TRY NOT TO SMILE when you watch this one … impossible! I enjoy the MMD videos with jokes or little dramas … or big action sequences … but these two videos, here, totally define MMD for me. … Let’s learn how to do Everything!